Oliver Morin/AFP/Getty Images) In a footballing world that has come to embrace the deep-lying midfield playmaker again, Pirlo still reigns supreme. In 2004, midway between Pep Guardiola leaving Barcelona as a player and joining it as coach, he described how his deep-lying, distribution-based midfield role was no longer wanted at the highest level. "The emphasis, as far as central midfielders are concerned, is all on defensive work," he told Gabriele Marcotti of The Times of London. "Players like me have become extinct." 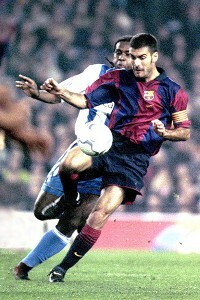 "Twenty years ago, many clubs had guys with my characteristics," Guardiola said. There was just one man he pinpointed as the exception. "Today, the only one I see is at Milan, with Andrea Pirlo." It should come as no surprise, then, that in a footballing world that has come to embrace the deep-lying midfield playmaker again, Pirlo still reigns supreme. Milan discarded him prematurely during the summer, preferring the industry of more defensive-minded players, the energy of Kevin-Prince Boateng and the younger guile of Alberto Aquilani. Milan is regretting it already. At Juventus, Pirlo's passing range is still there, and mobility was never his strongest point anyway -- he's spent a career learning how to defend intelligently without tearing around the pitch like his old partner Rino Gattuso. In pairing him with Claudio Marchisio, a hardworking player but far from a holding midfielder, manager Antonio Conte has shown great faith in Pirlo's ability to command the midfield zone. It's bizarre that Pirlo was the poster boy for deep-lying playmakers for much of the past decade. He started out as a No. 10, an attacking midfielder or a deep-lying forward, in roughly the same role as Roberto Baggio or Francesco Totti. He captained the Italian under-21 side to a European Championship win in 2000 and therefore was the next big thing in Italy. Pirlo struggled to make the first team at Inter, however, and spent a couple of years out on loan to Reggina, then Brescia. It was at the latter, his hometown club where Pirlo had spent most of his teenage years, where a revolution occurred. Having been unable to force his way into the Inter side because of so many other great forwards, returning to Brescia, where he was up against the legendary Roberto Baggio, was unlikely to reap many rewards. Firo/Allsport/Getty Images During his Barca playing days, Pep Guardiola kept the dream alive that a central midfielder could be a creator, a ballplayer and a beautiful footballer. Brescia coach Carlo Mazzone had a solution. Baggio had the No. 10 shirt and played behind veteran goal poacher Dario Hubner up front, while Pirlo took the No. 5 jersey and played deep in midfield. It worked brilliantly, and Baggio's most famous moment in a Brescia shirt came because of Pirlo. Away at Baggio's old club Juventus, Brescia trailed 1-0 in the 86th minute. Pirlo got the ball on the halfway line, looked up and lofted a ball over the top of the defense. Baggio produced a moment of extraordinary skill -- bringing the ball down, rounding Edwin van der Sar and rolling it into the empty net. All that, in only two touches. Baggio was in the headlines, but Pirlo was the architect. Few other clubs at that time would have had the invention of a genius deep in midfield to play the pass and a genius to finish the move in that style. When Pirlo's loan expired that summer and he was bought by Milan, to whom did Brescia turn for its deep-lying playmaker? A man named Pep Guardiola, whom no other club wanted after his departure from Barcelona. Pirlo, Guardiola and Mazzone kept the dream alive, the idea that central midfielders didn't need pace and didn't need to be a tackler. You could be a creator, a ballplayer, a beautiful footballer. Guardiola returned to Brescia earlier this year, dining with the club's technical staff and visiting the club's training ground. "If I return to work in Italy it will be to train Brescia," he said. "And I'll do it for free." A joke? Probably -- but don't underestimate Guardiola's faith in his ideology and his appreciation for the historical roots of footballing styles. When he was studying to be a coach, he visited Milanello to see how Milan trained -- and for the first time, he got to meet Pirlo. Where would Pirlo be without Mazzone's decision to move him deeper? Compare his career with that of another promising Italian No. 10 at the turn of the century -- Domenico Morfeo. A wonderfully talented player at under-21 level, 5-foot-7, clever on the ball and a great free-kick taker, he had the ability to play for a top side, but both Milan clubs used him sparingly. A half-decent Serie A career followed, but he retired from football at age 32, saying he had gradually lost motivation for the game. The last club to take a chance on him? Brescia. You've got to admire it for giving it a go. Pirlo, meanwhile, was linked with Barcelona this past summer, but ultimately it simply had too many central midfielders to justify bringing in one more. His move from Milan meant he didn't get the chance to face Guardiola's Barcelona side in the Champions League in September. "Pirlo is no longer there, and AC Milan has lost a fantastic player," Guardiola said. "But Van Bommel is a player of great value." Certainly, but Mark Van Bommel epitomizes almost the exact opposite of Guardiola and Pirlo -- cynical and destructive. He won the Champions League in 2006 with Barcelona, in a final when Xavi Hernandez and Andres Iniesta started on the bench. It's hard to imagine such a selection decision now -- beauty has overcome the beast. Apart from at Milan -- how ironic, considering the Italians were the ideologists of the 2000s. Guardiola slammed Milan's defensive approach after the 2-2 draw in its Champions League encounter in September, perhaps out of disappointment as much as frustration. "Milan couldn't get across the halfway line," he remarked. "They only attacked two-and-a-half times." Pirlo would have helped the club create more. Pirlo may never have been coached by Guardiola, but when asked whom he considered his "maestro," he was quick to respond. "Pep Guardiola. In this role, he has been a model. Or rather, the model: for his vision of the game, his calmness and his passing ability. Thanks to him, Barcelona is the now the finest team in Europe. It's so impressive, the speed with which they circulate the ball." Pirlo has tentative plans to go into coaching when he retires. He speaks about football with the thoughtfulness of Guardiola, and maybe someday he'll inspire a similarly great side as coach. Milan has a habit of appointing its former midfielders as managers -- Fabio Capello, Carlo Ancelotti and Leonardo. But then, don't expect Pirlo to go into coaching any time soon, for he doesn't need to retire just yet. He helped preserve Guardiola's ideology; now Guardiola's popularization of the passing midfielder is helping to prolong Pirlo's career. Other players and coaches should watch him, admire him, learn from him. Michael Cox is a freelance writer for ESPN.com. He also runs zonalmarking.net.